Icarus House occupies a corner position which is ideal as there are small secluded garden areas to the side and rear, both with patios. The pool is just a few steps away, but because of the corner position if you just want a quiet drink on the patio you will not be disturbed by people using the pool. The garden areas have gates so your small children cannot wander off. There is also a roof terrace which is ideal for private sun-bathing, as adjacent properties do not have roof terraces. Inside the house the large living room has sliding glass doors from both the lounge area and dining area, leading out to patios. The kitchen is well equipped, with washing machine, dishwasher, fridge/freezer, microwave, toaster, full oven, induction hob, and plenty of crockery, pans and utensils, etc. There is also an ironing board and iron, plus pegs and a washing line. There's an information folder on the bookcase or possibly on the dining table ready for your arrival. We are a couple in our sixties and we hope to retire to Cyprus. In the meantime we rent out our house to help pay the maintenance costs. toilet, combination tub/shower, 1st floor. Electric heater for winter. As well as the main bathroom on the first floor, with a shower over the bath, there is a downstairs toilet and shower room. The water pressure is good. The hot water is solar heated, although there is also an immersion heater for the odd day in winter when the sun may not be quite up to the job. Air-conditioning units can be set at a higher temperature and they will heat as well as cool. Free-standing halogen heaters also provided. Beds made up ready for your arrival. For longer stays the sheets will be changed weekly. Space on the driveway for one car. Small private car park to the rear of the house. Easy to park on road in front of house. You should find a bath towel and a hand towel per person laid out ready for you. Whilst we don't officially provide beach towels you may find some in a cupboard. We don't mind if you use them. Leather sofas and chairs (as per photos), coffee tables, TV, DVD player, some books. Wii games console. The dining table extends (it pulls out from the end near the patio door) to accommodate more people. There are six dining chairs, but if you have guests you can use chairs from the bedrooms. Subscription TV service (included in price) via internet with innumerable English channels, movies, catch-up TV and more. In the bookcase near the front door there are some books. They are mostly English language books that previous guests have kindly donated. A few books in German too. Not many, but you'll find playing cards, Monopoly and a jigsaw puzzle. Small garden areas to rear, side and front of house. Mature hibiscus hedges provide privacy and gates prevent small children from wandering off. Small balcony off of the main bedroom (at the back of the house) with views of the pool. Ideal for that early morning coffee. Roof terrace and two secluded patios (to rear and side of house). Sun beds & umbrellas provided. Shallow end with wide steps - no life guard. We have stayed at this property a few times now. 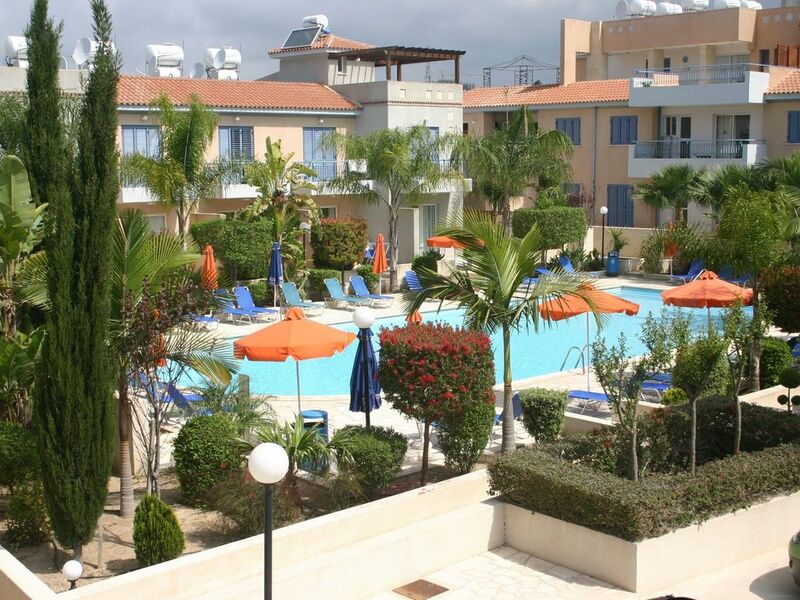 It is a lovely spacious,clean house that has everything needed to enjoy your stay in paphos. It is approximately 15 minutes walk to the harbour area where there are numerous bars and restaurants to be enjoyed. The house has 3 air conditioned bedrooms and air conditioning in the lounge area as well. Overall it is a lovely property with a shared pool in the universal area of paphos.The owners Ian and Cheryl are always lovely to deal with and make booking etc very easy to organise. From the moment of booking to the moment we left Icarus House everything was perfect, Cheryl was so helpful even helping with booking of our taxi from the airport. Icarus House had everything you needed it was like being at home but with the sun!!. The house was so spacious and clean and the washing machine and dishwasher were a god send! The kids loved the swimming pool and there was plenty of free sunloungers everyday. returning to Icarus house in the future. Thank you to Cheryl and Family for letting us their house. The apartment is very light, airy and spacious (three good sized bedrooms with large wardrobes) and set in a very lovelyquiet location, which we loved as that’s the type of location we prefer rather than being right in the busy city centre. There is ample parking both off road and just in front of the apartment. The house has the advantage of having two bathrooms which made it easy for us (family of five) to cope with getting ready. The apartment is adequately furnished with the necessary kitchen equipment to prepare meals, and also the advantage of a dishwasher even though we did not use it. The microwave came in very handy and the washing machine was indispensable! We were impressed with the many 3-hole adapters and sockets which meant we could charge our phones and tablets anywhere in the house; this was very thoughtful on the part of the landlord/lady. There were a few house keeping issues which we very strongly feel need to be addressed -The apartment did not appear to have been cleaned in anticipation of our arrival: the floors, surfaces and kitchen equipment were very dusty that we had to wash, mop and dust before settling in. Unfortunately, the outside space, though of descent size and an asset to the apartment, was also not clean. We feel that the apartment will benefit from having some of the furniture replaced; the leather covers of the two recliners in the living room has faded, the shower curtain in the upstairs bathroom has some brown/black mouldy patches at the bottom hem. On the plus side, the fridge-freezer was a good size and very useful, the dining table was a very good size as we could all have our meals together, the proximity to the pool was excellent and the fact that the pool was only accessible by a select number of apartments made this house very attractive as a lot of the time there were only about 2-3 families or less in the pool at one time. This alone would make us come back to this apartment as we never get this much freedom and access to a pool in most of the resorts we have been to. We would love to come back to Icarus House as it served us well in terms of space and location and pool facilities, though we would love to come back to a cleaner house. property not as advertised, photos were not honest, the house is in need of remedial work. Although the area was nice and quiet, we couldn't help but notice the severe cracks in the bedrooms, and in the kitchen, even the tiles were damaged, the master bedroom door wouldn't close and one of the twin room door didn't close, the middle bedroom had a terrible crack in the wall and the upstairs bathroom ceiling looked like some plaster was about to fall off. The internet didn't always work, and the outside patios needed a good clean, the owners had just left so I would of expected it to be tidier, this is a real shame, I would expect the owners to have made sure the outside was clean and tidy knowing that we were coming out the week after them, most conversations were by e-mail, they were answered promptly. We hired a car to get around easier, the Pambis cafe and bar was really nice and just a short walk away, also the Crocodile pub. The pool area was lovely, and we did not have to worry about sunbeds as there were plenty around. Thank you for taking the time to write a review for our house. I am pleased to hear that despite some negative comments you did seem to enjoy your holiday in Paphos. I can assure you that the photographs were not re-touched in any way and they were a fair representation of the property as it was at the time they were taken. As regards the cracks, unfortunately this is not uncommon in Cyprus, but once we have guests booked in for the season, any remedial work has to wait until the house is empty for a spell, generally over winter. I am sure you would not have appreciated having workmen in during your stay. We were not in Paphos the week before your stay. The guests prior to yourselves were on their fourth visit to us. Regardless of whether it was us or other guests in the house prior to your stay, the patios should have been clean, and this is something which I will question the cleaners about. Our internet provider gives a choice of mini, basic, standard, large and extra large packages. We pay for the top one, the extra large, so I am not sure why you had problems with the internet. The construction of the house means that it may not be possible to get internet upstairs, but it shouldn’t have been a problem in the lounge. We do strive to maintain standards, but sometimes things happen which are outside our control and cannot be fixed instantly. However, we will take your comments on board and aim to be back up to our usual standard for next season. We are already exploring options for different cleaners. A brilliant well equipped, well maintained house within walking distance from the old town, new town and the beach. The communication with Cheryl, the owner, was easy and very informative. Thank you. Icarus House is situated on small friendly complex in a residential area of Paphos. It is within walking distance of the the tourist area of Kato Paphos where you will find a large supermarket, numerous restaurants, bars and smaller shops, as well as the harbour area with the old fort. Also within walking distance is the older part of Paphos (Pano Pafos - or Upper Paphos as it is situated on a hill). In this part of town there is a daily market, selling all sorts of things from fresh veg. to souvenirs. A bus service runs close to the house and there are several mini-supermarkets within a few minutes walk from the house. There is a snack bar just two minutes walk from the house. Many people have enjoyable holidays without hiring a car. Everything you need is available within walking distance, and if you fancy a change of scene you can get buses to other areas - for example Coral Bay. There are also tour operators offering various trips, but for the more independent traveller, car hire does give the chance to explore at your own pace. Ancient ruins/churches etc. Paphos has a wealth of sites of cultural interest. There's the old fort by the harbour, and the nearby Paphos archaeological park with its Roman mosaics then there is the Tombs of the Kings just up the road with its rock tombs. There are also numerous places that you can just explore by yourself without paying an entrance fee. Just south of the Kings Avenue Mall there is the site of the Solomoni Catacombs and wandering on towards the harbour you'll find St. Paul's pillar an old church and columns and mosaics from a much earlier period. Golf: There are several golf courses within the vicinity, Aphrodite Hills, Minthis Hills, Secret Valley, Elea Golf Club. Further details can be found on the internet. Ski: You can ski on Mount Troodos. The season is normally from January to March. The ski area is not extensive but it makes an alternative activity. Equipment can be hired in the ski area.